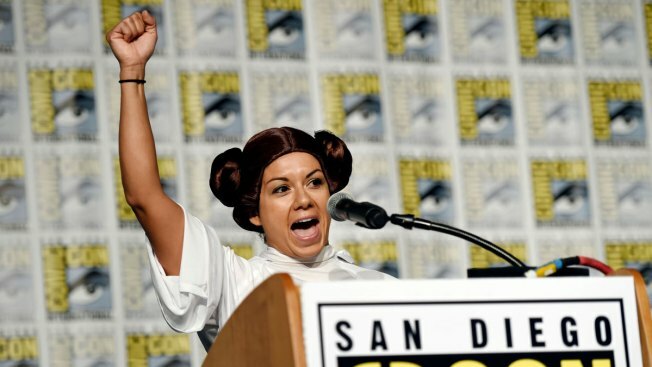 Guest speaker Diana Font of Orange, Calif. addresses the audience during the Princess Leia Star Wars Fan Club Tribute Presentation during the 2017 Comic-Con International on Sunday, July 23, 2017, in San Diego, Calif.
Four "Star Wars" costuming clubs held a tribute to their favorite fallen princess at Comic-Con. The fan groups celebrated the life and work of Carrie Fisher as Princess Leia at the pop-culture convention in San Diego on Sunday. Several women dressed in Leia's flowing white gown and iconic twin buns spoke about how much the character inspired them. One said she walked down the aisle at her wedding to Leia's theme. Another said, "You put on a pair of buns, and you're unstoppable." One of the key attractions at any Comic-Con is the fan-made costumes. NBC talked to a few attendees about what inspired their look and how much it cost to put it all together. The presentation included an exhibit of fan art created after Fisher's death last year. The fans also celebrated the life of Kenny Baker, the actor who played R2-D2, who also died last year. Members of the R2 Builders Club honored him by bringing out four replica droids they built.